This is my take on one of the best ways to store your Spellbinder Dies, My Favorite Things Die-Namics, Cherry Lynn Design Dies or any of the thin metal dies that are on the market today. I will be teaching a class on this at our local scrapbook store, School Adventures. I covered the front quite simply as it will most likely be handled quite a bit and bulky embellishments would just not work. The side border is done with the Martha Stewart Deep Edger Punch Floral Vine. The label is a combination of Spellbinders Labels 20 and Fancy Tags 2. The corner pieces are from Spelllbinders Fleur De Lis Accents. 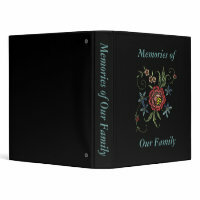 Binding was done with a wonderful new product from We R Memory Keepers, the Cinch. The pages are all black chipboard. You could take this farther and label each die under it's location or put tabs on the side for circles, squares, ovals, ect. I wanted the inside to be simple and just do what it is supposed to do, keep the dies neat and easily plucked from their magnetic holders. It is always difficult to remove them from their sticky tape on the packaging every time you need them and they are easily bent. This way they just come right off and go right back on. No opening that plastic thing that always cuts my finger and fighting with the sticky tape. Just another view of the inside of the book. I hope you've enjoyed your visit today and have a wonderful week-end. I love this beautiful book for storing your die cuts. I have my stored on pegs for quick and easy access, but this would be a fabulous way for me to carry them to card swaps! Thanks for the inspiration! I like these all lovely books. But I think it these are very costly. This is great storage solution.